Throw-back Thursday | What's that, UASC? Originally published May 2011 on our Rare Books Online Showcase; written and compiled by our in-house digital wizard (then supervisor), Joel Salt. American poet Walt Whitman was born on 31 May in 1819. To celebrate his 192nd birthday Special Collections is going to showcase its first Boston edition of Whitman’s most famous work, Leaves of Grass (1860). 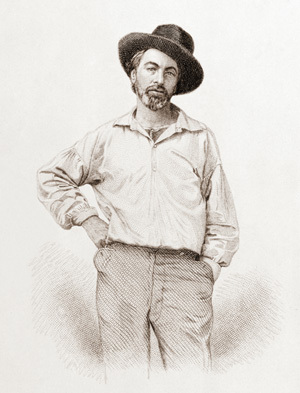 Whitman worked as a journalist, teacher, government clerk, and volunteered as a nurse during the civil war, but he is most known as a poet, especially for his celebrated book of poems Leaves of Grass, first published in 1855. It was paid for by Whitman himself and was highly praised by Ralph Waldo Emerson, who wrote a flattering letter to Whitman after reading it for the first time. Some other major figures of the day, however, did not care for it. In fact, poet John Greenleaf Whittier reportedly threw his copy into a fire. Many people rejected the work for the “obscene” nature of the poetry and even Emerson eventually cautioned Whitman to tone it down during some of Whitman’s revisions. Whitman refused to censor his work, which resulted in him switching printers. The work made Whitman popular with other writers too and he became a part of the transcendentalist movement along with Emerson, Thoreau, and others. The poem “Song of Myself” has become what Whitman always wanted: a quintessentially American epic poem. Whitman emphasized the “I”-narrator, who attempts to relieve national problems, especially urbanization. Whitman wrote in the preface to the 1855 edition “the proof of a poet is that his country absorbed him as affectionately as he has absorbed it. ” For Whitman, the “I” is irrevocably connected to society and vice versa. Modernist poet Ezra Pound called Whitman “America’s poet … He is America.” Literary critic Harold Bloom writes in the introduction to his 150th anniversary of Leaves of Grass, “if you are American, then Walt Whitman is your imaginative father and mother … [No American classic is] as central as the first edition of Leaves of Grass.” Over the next 32 years Whitman published several new editions of Leaves of Grass. Editions appeared in 1855, 1856, 1860, 1867, 1871–72, and 1881. Some people include editions in 1876, 1888–89, and 1891-92 as well. To see these wonderful Whitman books come to [University Archives &] Special Collections at the third floor of the Murray Library to room 301; you can view the Whitman materials in Special Collections though the catalogue. This entry was posted in Rare Books on May 7, 2015 by UASC.